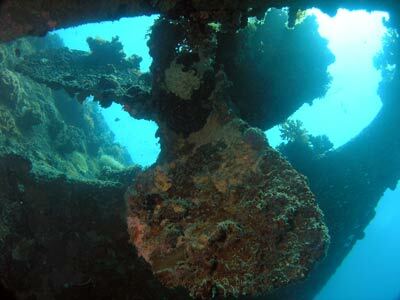 When you dive George's Wreck at Rabaul in New Britain Provence, Papua New Guinea, with Kabaira Dive, your second dive is normally a series of more wrecks located off a resort called Kulua Lodge. If you are in a largish group, most of the group will normally travel by vehicle to the dive location. In between the dives, you are taken on a bus trip via Rabaul. This gives you excellent views of the active vvolcano, the Japanese War Memorial and the ruins of the town of Rabaul. See my article on Rabaul/Kabaira General Matters for more information. Once you arrive at Kulua, you normally have lunch before setting up for the second dive of the day. 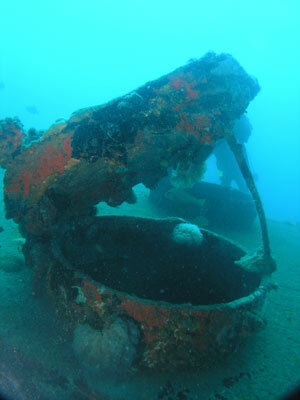 This is on three large wrecks and three smaller ones which are located only a few hundred metres off the beach. 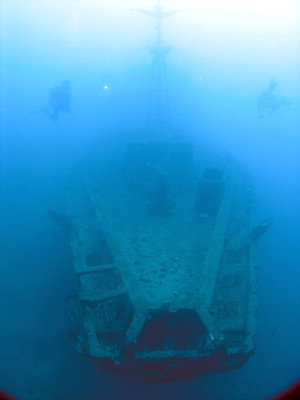 As you can imagine, it is only a minute's run out to the site of the deepest wreck. This is called K1 for want of a better name (and because the dive operator does not know the name). This is located at S4º 12' 8.0" E152º 6' 19.8". 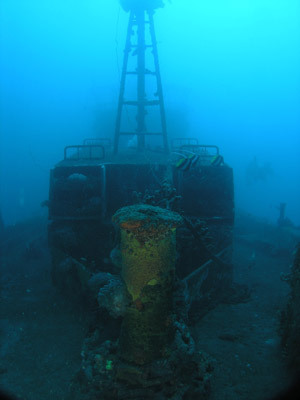 K1 is a trawler of some sort and sits with the stern in shallower water and the bow in 40 plus metres on a sandy bottom. It is sitting upright and points rougly in a north-east direction. It is about 25 to 30 metres long and of steel construction. This vessel has a very strange shaped bow, with a long skinny prow. Some good photographs can be taken of the bow and there are sometimes sharks under it. Behind the bow there are a couple of holds and then the bridge. You can enter the bridge but there is only space for a couple of divers. 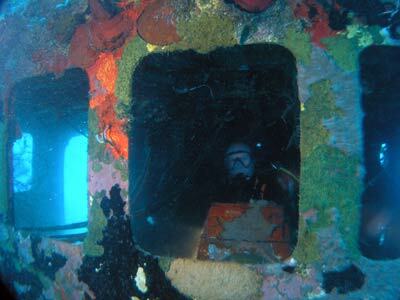 At the stern, you can drop down to the prop and rudder and get some more photographs. Behind this wreck there are two smaller wrecks. These are a barge about 15 metres long and a six metre runabout. Near here there are lots of artillery shell casings. It is possible that a warship was anchored here during the war and during a battle the shells were dumped overboard. There are at least a couple of hundred and the sizes seem to be six and eight inch. There is a line from this wreck to the next one. Despite what the dive operator told us, it is about 100 metres from K1 to K2. The line gradually goes up the sand to K2 which is shallower. K2 is a large barge, lying upright. It was possibly an oil barge, or perhaps palm or coconut oil. It had a prop at one stage as the shaft hole can be seen as can the rudder. This vessel is facing roughly south-west. It is about 50 metres long. There are dozens of individual compartments, all with their own hatch. It would not recommend entering them as they are relatively small, empty and full of silt. 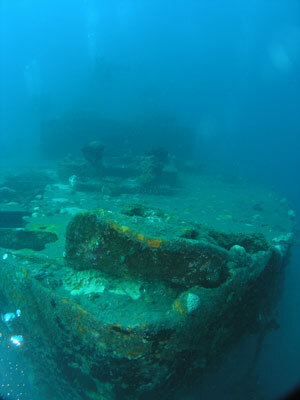 It is about 75 to 80 metres to what I had at first thought was a the last wreck. 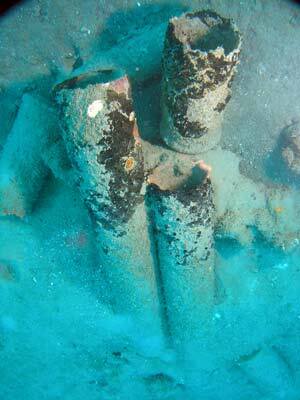 However, this is the ruins of a vessel, probably timber, as most of it is gone. There is a lot of junk all over the place. 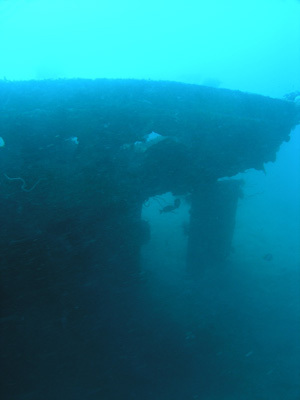 This wreck has a lot of great fishlife on it, including many firefish, anemones and clownfish. It is about 60 metres to the next wreck, K3. Again you follow a line. This last boat is a small coastal freighter, about 35 metres long. It is lying on its port side, facing south-west. From the bow there is a large hold, then the bridge, then the engine room with skylights. The prop and rudder are in place and again provide a nice photograph. 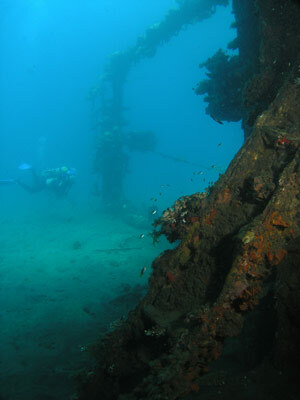 This wreck is very colourful, with lots of small gorgonias, anemones, clownfish and firefish. This is a very good dive, that gradually rises from about 40 metres to 10 metres. 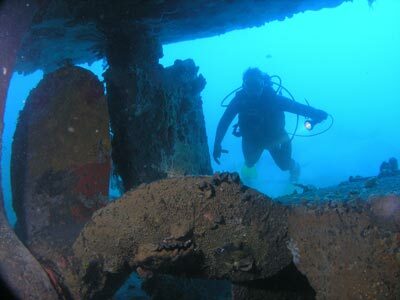 You can do your safety stop on the hull and side of the wreck. The visibility here is about 15 to 20 metres. After the dive, if you get the chance, take the boat back to Kabaira Resort as it gives you a good view of the coast and it is only a maximum of 45 minutes (it was a little choppy on the day we did it).